4 off our junior girls have excelled at the Scottish Junior Tour held at Turnhouse Golf Club over the weekend. Fantastic performance from all the girls - we at FCLGA are so proud of you all. Ellen, Caelan, Charlene, Hannah, Jenna & Hannah all enjoyed their game at Leven Links. The weather was glorious and the course in great condition. Some of the girls had played Leven just the once but this didn't stop them from giving their all. The course was very busy and there was no end of compliments by other golfers who witnessed great swings and shots. Congratulations to Jenna who won with a net 74. Thank you to Leven Links Golf Club for hosting the competitions, it is very much appreciated. Today, myself and 5 of our junior girls visited the new R&A Equipment Testing Centre, based at Kingsbarns. Dr Steve Otto, Director Equipment Standards kindly showed us around the facility which is a stunning building. He demonstrated several tests including the Archimedes Principle to measure the volume of a driver head and a robot driving the ball which received a lot of appreciation from the girls and the 3 Dads who couldn't resist the opportunity of joining the tour. On behalf of FCLGA I would like to thank Steve for the tour which we all thoroughly enjoyed. Evanna & Anna, two of our junior girls have qualified for the Scottish under 18's Tour which will be played at Forrester Park, Dunfermline on 1st & 2nd April. They will also compete in the Scottish Girls Open Championships at Montrose Golf Club, which starts on 12th April. Porscha will head to Roganstown Golf Club in Ireland to compete in the Irish Girls Championships 7-9th April. I know the girls would be delighted to see as many FCLGA supporters to cheer them on. FCLGA is extremely proud of all our juniors and we wish Evanna, Anna & Porscha every success in these competitions. I'm delighted to announce the appointment of Evanna as Junior Captain for the Cuthbertson Cup team 2017. Evanna currently holds a handicap of 5 and she won the FCLGA Junior Championships in 2015 & 2016. I have every confidence in Evanna to lead her team on the day. On behalf of FCLGA I wish them every success. 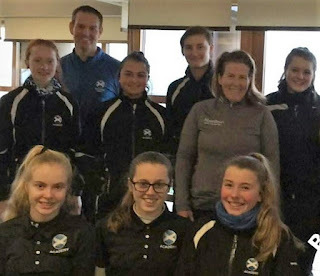 Three of our junior members Evanna , Porscha and Anna were at St. Andrews last weekend for winter training with the Scottish Golf Academy. There was another golfer there too, Ladies European No. 1, Beth Allen! The girls played a few holes on the New Course with Beth, can you imagine the excitement of hearing Beth talk about her life as a professional golfer? Experiences like this can only encourage junior girls to firstly enjoy the game but also to work hard and maximize their potential. Who knows in years to come a FCLGA junior may follow in Beth's footsteps.